Supporters of Johnson Elementary took another passionate stand in support of the school’s move to the more desirable site of the old Priestley campus during a Recovery School District public hearing Wednesday evening, while Booker T. Washington supporters questioned a plan to tear down and rebuild most of that historic building to house two separate high schools, including a charter-run version of Walter L. Cohen. Two deputy superintendents promised the Carrollton neighborhood leaders that they would be involved in an upcoming feasibility study of the Priestley site. To questions about the plans for Booker T. Washington plan, they replied only that nothing is final and that they are continuing to hear concerns from the community. Johnson | Moving a steadily-improving educational program at James Weldon Johnson Elementary into a more prestigious, safer location at the old Priestley campus has been a top priority for members of the Carrollton-Riverbend Neighborhood Association, and the half-dozen proponents of the idea dominated the small crowd at Thursday’s public hearing. The latest facilities plan calls for an engineering study to determine the cost differences between renovating Johnson’s current campus versus building at the Priestley site, and association president Anne Wolfe Nicolay insisted that neighborhood members be involved in the actual studying — not just given a report to read and react to afterward. Deputy Superintendent Ramsey Green agreed to involve the association. Under further questioning from the neighborhood, he and Deputy Superintendent Chris Meyer said the RSD’s hope is for every high-performing direct-run RSD school to become a charter unto itself — for successful administrations like Johnson’s to “self charter,” in other words — but for all failing schools to be taken over by proven charter operators. Booker T. Washington | The current plan for the Booker T. Washington campus has several parts, the superintendents said. 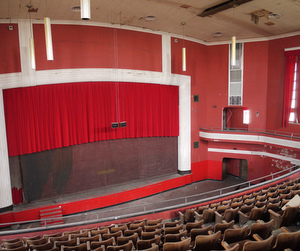 First, the majority of the campus will be demolished, except for an auditorium that Green called one of the most historically significant school buildings in the city. 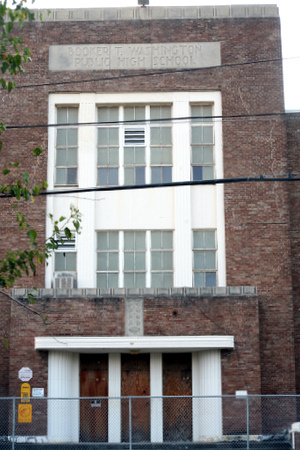 Then, the Walter L. Cohen High School run by charter operator New Orleans College Prep will move into half the campus. Finally, a high school focused on career training will be given the other half, though both that school’s operator and that school’s name have yet to be decided. The cost of operating that auditorium, the superintendents said, dictated the need for two high schools’ worth of students at the site. Members of the Cohen alumni association have already stated their vigorous opposition to a merger with Booker T. Washington, and the plan raised serious concerns for a group of Booker T. Washington alumni at Wednesday’s meeting. For example, the RSD should make more of an effort to save more of the campus, they said. Architect John Williams, who was also at the meeting, said the $75 million estimate for renovating the campus seemed unusually high to him, and offered to survey the site for a second opinion. Booker T. Washington alumni also aired concerns that two separate programs on one campus could breed social tensions for the students, as some parents have already complained about as College Prep takes over the Cohen campus one year at a time. Instead, the RSD should focus on recreating the wide range of technical programs that Booker T. Washington formerly offered, such as construction, agriculture, cosmetology, nursing and many other fields. Banneker | Finally, one Hollygrove resident asked about the plan to move Banneker Elementary to the Dunbar site. Why do that if Banneker’s scores are low? he asked. That specific line on the plan is sort of a placeholder, Meyer replied. If Banneker, another direct-run school, improves its scores sufficiently, then it may self-charter and move to the Dunbar site. If sufficient gains are not made, however, another operator will likely take over Banneker, and that program will move to Dunbar, he said. Either way, the current Banneker site will be vacated. To read our live coverage of the comments during the public hearing, click “Replay” in the box below.